The European Commission wants EU member states to consider allowing it to levy direct taxes - a move that could ease the burden on national budgets. 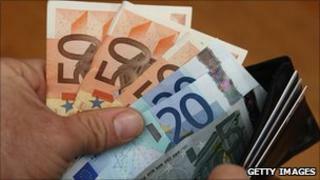 The EU's Budget Commissioner, Janusz Lewandowski, said he would present some options next month for direct EU taxes. Taxes on aviation, financial transactions and CO2 emission permits are all possibilities, he told the daily Financial Times Deutschland. However, the UK promptly rejected the idea. "I'm hearing from a number of capitals, including important ones like Berlin, that they would like to lower their contributions [to the EU]," Mr Lewandowski said. The 27 EU member states pay a fixed contribution to the EU budget, based on their gross domestic product and a percentage of their sales tax (VAT). This year Germany's transfer to the EU budget - the largest contribution - is about 21bn euros (£17.5bn). "Many countries want to be unburdened. In this way, the door has been opened to think about revenues that are not claimed by finance ministers," the commissioner said. Traditionally taxes are seen as a prerogative of nation states and any move by the commission to levy taxes directly is likely to be opposed by Eurosceptics wary of Brussels's powers. A British treasury minister, Lord Sassoon, said the British government "is opposed to direct taxes financing the EU budget. The UK believes that taxation is a matter for member states to determine at a national level and would have a veto over any plans for such taxes." France and Germany are pushing for a financial transaction tax in the EU, but the UK argues that any such tax must apply globally and be co-ordinated by the International Monetary Fund. However, all three countries are introducing separate bank levies, which will not affect smaller banks and building societies. The UK levy is expected to raise more than £8bn over four years. The EU's budget for this year is 122.9bn euros (£110bn) - nearly half of which is allocated to agriculture and natural resources. It is 6% bigger than the 2009 budget.